There’s something quaint and inviting about seeing rocking chairs on a front porch, and that porch could be yours! As the weather gets warmer, it’s time to make your outdoor spaces comfortable and well-equipped to spend lots of time outside. Setting up your outdoor spaces starts with picking out furniture, and Amish Originals offers a quality and affordable selection of outdoor seating. Rocking chairs are great for sitting outside and enjoying a nice breeze, and add amazing curb appeal to your home when set up on the front porch. Our outdoor rocking chairs are made with either treated Pine or Poly Lumber, both of which are excellent outdoor materials that withstand harsh weathering. Poly Lumber chairs are available in multiple colors including dark red, weatherwood, green, cedar, black, brown, and white. 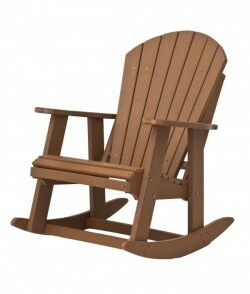 Contact us today for a quote on an outdoor rocking chair.